Below is a collection of (free and legal) online resources that I believe will be of particular profit to scrupulous individuals. Here is Chapter III (pp. 9 – 12), which consists of a Sermon for the 3rd Sunday in Advent, from Bl. Henry Suso. Unfortunately, this excellent work is quite rare and expensive. 1. What sin really is. 2. No involuntary thought sinful. 3. When there may be venial sin. 1. In what does sin really consist? It is when a man with certain and deliberate will, knowingly and willingly, without contradiction of reason, turns his soul away from God and turns himself to wickedness. * This opinion about the first motions of concupiscence and the fight of the flesh against the spirit without the consent of the will in the sin is taught by St. Thomas, Summa, I-II, ques. 80, art. 3, ad. 3m. See the Council of Trent, Sess. 5. Tagged bl. henry suso, blosius, catholic, christian, faith, fr. faber, fr. william doyle, god, Jesus, love, quadrupani, scruples, Scrupulosity, St. Augustine, st. francis de sales, st. louis de montfort, st. thomas aquinas, unwanted thoughts, what is sin? Do We Value God’s Love As Our Only Good? After reading the lives of the Saints, I am often left wondering: How is it that anyone could possess so much love?! Charity unites us to God, who is Love itself. The closer the bond, the greater our love. Love is not merely act of the will, nor does it consist in “headwork”, but rather it is “… the result of accepting generously all sacrifices, in accepting with a loving heart all trials” (Saudreau). After having been purged of their sinful affections, the Saints were able to comprehend the most sublime spiritual truths. Sin appeared to them in all its vileness as nothing more than a detestable thorn in the side of their Beloved; worldly goods and honour were despised as temptations to pride, vanity and self-love, which stain the soul, displease God, and take us far from the narrow gate that leads to eternal life. “No more sin! No more sin!” cried out St. Catherine of Genoa. “Enough of sin! LOVE HIM! LOVE HIM!” exclaimed Bl. Alexandrina. These are the words of souls in love with God; souls who knew that sin has frightful consequences, and that it has nothing to offer us but emptiness; for where sin is, there God is not. St. Paul was able to exclaim: “It is no longer I who live, but Christ Who lives in Me.” These are the words of one who has reached a state of sublime union with God! These words are not fitting for one who takes delight in sin, however small. It is only in uniting our will with God’s will that we allow His love to act within us, to transform us, and to carve us into beautiful statues fit for the Garden of Paradise! As it is impossible to value something that we do not know, let us make a resolution to meditate for at least 15 mins a day (if we do not already do so) on God’s love for us. 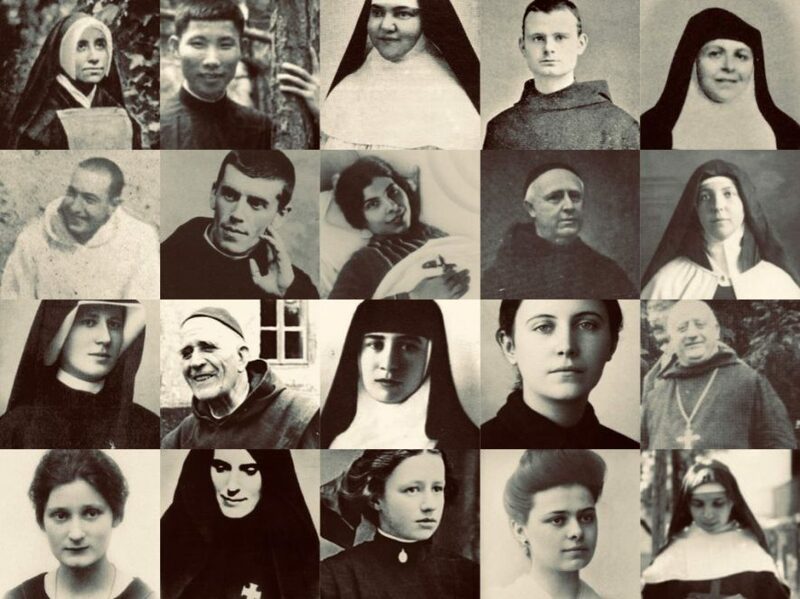 (All the Saints recommend this, and charity demands it, considering that God’s showers countless graces upon us each day)… We may consider the graces that He has bestowed upon us, what He suffered for us, the countless times He has drawn us from sin to repentance etc. etc. God, In His Love, Would Close Hell If It Were Possible! – Revelation of a soul to Sister M. de L. C.
A Dominican nun (a saint) one day begged of God that He would close the entrance to Hell, so as to hinder souls from falling there. God replied that He is unable to do so. Why? Because Love is not unjust. If a king, for example, destroyed all prisons, evil would multiply without measure. God sets a limit to evil, not only for the sake of the sinners, but for the sake of the innocent. Consider the sin of scandal, which prevents so many souls from entering the Church and being saved! Our Lord speaks very strongly about scandal in the Bible. God loves souls tremendously. He is infinitely merciful to the repentant and to those who fear Him ie. who keep His commandments. Many fail to realise that those who abuse God’s mercy will receive His justice. God’s great love is a reason to obey Him and seek to please Him. 1. God loves us because He is good. Everything good we have comes from God. We can reject His love, but we can never, ever earn it. That is a consoling and humbling truth. 2. God desires our love for Our sake. God does not need our love; our love adds nothing to God’s infinite goodness. He abases Himself to ask for our love, because He created us out of love, to love, and for love (ie. for Himself). 3. God loves His enemies. Jesus died for even the worst criminals, and He has drawn many great sinners to repentance and salvation. The grace of repentance is a more valuable treasure than any earthly gift, because grace is a participation in the divine nature; grace unites us to God, our final end. 4. God punishes the guilty with reluctance. Jesus came to save sinners, not to condemn them. He would not undergo such excruciating torments if He was unwilling to apply the fruits of His redemption to souls. Christians have a crucial role to play here: evangelisation, prayer and holiness are our privilege and duty! A sinful soul impedes the redemption of others. The following revelation is quoted for the purpose of reinforcing the four aforementioned ideas. God loves all souls, including the most sinful. “Come to Me,” He says. “Keep the commandments,” He adds. There is nothing more to it. Salvation is ours if we die with humble and contrite hearts, even if we had lived like St. Dismas, the Good Thief. God asks us to obey Him, not because He places conditions on His love, but because our hearts wither and die when they turn away from God, Who is love itself; He is our final end, and the commandments tend towards that sublime end! and see it again united to My living members, that is, to My elect who live eternally in the Holy Spirit, by the life which comes from Me, Who am the living life, that is, the life of all living creatures. You may judge by all that I have said, how inexpressibly dear a human soul is to Me. A Sure Way to Convert Sinners, Even in their Final Moments! The Sacred Heart thrills with joy and Heaven rejoices when a sinner returns to God. How beautiful it is to bring souls to God! Our Lord revealed to Servant of God, Sr. Josefa Menendez, that confident and persevering prayer generally obtains the conversion of the souls for whom we pray; if they reject the graces offered, someone else receives them. Prayer, therefore, is never in vain! Also, Our Lord revealed to St. Gertrude that He converts souls in His own time; He alone knows when they will best be disposed to accept His grace. The Precious Blood of Jesus is the price of our salvation. It is a gift of infinite value, perfectly pleasing to God the Father. Few souls know this, but the Precious Blood is God’s gift to us! This has been confirmed by theologians and Saints e.g. St. Mechtilde and St. Mary Magdalene de Pazzi. The following words ought to encourage us to pray for the conversion of sinners, even in their final moments. The prayers suggested (in italics) are remarkably powerful! + Our Lord to Sister Mary of St. Peter: “Ask My Father for as many souls as I shed drops of Blood during My Passion.” By asking for the Precious Blood to be poured out on souls we prevent Its being, as it were, spilled out on the ground in vain. In His mysterious Providence God has put the salvation of others in our hands: we must ask for it, and ask fervently and often. At another time when St. Mary Magdalene de Pazzi was in ecstasy, she saw all the holy patrons of the city of Florence [accompanied by innumerable other saints], before the throne of God interceding for sinners. Their petitions, however, remained unanswered. Then the guardian Angels of the poor sinners approached, but their prayers likewise remained unheard. Next came the multitudes of the blessed to make intercession for the guilty souls. While imploring God’s mercy, they were intent at the same time upon offering to the Eternal Father the Precious Blood, and on account of the merits of the Divine Blood, their petitions were granted. Ought not these examples incite us to offer the Precious Blood frequently during the day? Amend Your Life and You Will Be Saved! “Mercy is, accordingly, pronounced to anyone who repents of his sins and resolves to sin no more, for My Spirit shall inspire him to perform good works. Whoever freely desires to be separated from the vanities of this world is made more fervent by My Spirit. Docility to the inspirations of the Holy Spirit is the only means to sanctity and salvation. The following words of Our Lady to St. Bridget of Sweden will help us to discern the inspirations of the Holy Spirit, Who always produces peace, clarity and obedience. First, the Spirit of God makes a man deem the world worthless and consider in his heart all worldly honor as mere air. Second, it endears God to the soul, and all delight in the flesh grows cold. Third, it inspires him to patience and to glorying only in God. Fourth, it stimulates the mind to be loving and compassionate with one’s neighbor and even with one’s enemies. Fifth, it inspires him to all kinds of abstinence, even from licit things. Sixth, it makes him trust in God in the midst of hardships and even to glory in hardships. Seventh, it gives him the desire of wanting to depart and to be with Christ, rather than to prosper in the world and become soiled. The evil spirit has seven effects to the contrary. First, it makes the world seem sweet, and heaven distasteful. Second, it makes a man seek honors and forget about the meaning of his life. Third, it arouses hatred and impatience in the heart. Fourth, it makes him bold toward God and obstinate in his own plans. Fifth, it leads him to make light of his sins and to make excuses for them. Sixth, it inspires in him frivolity of mind and every carnal impurity. Seventh, it inspires in him the hope of a long life and a feeling a shame about going to confession. Venerable Louis of Blois (Blosius), a holy and learned Benedictine, was often praised by St. Alphonsus. His writings are among my favourite spiritual works. They are very inspiring, concise, practical and balanced.